Our eagerly anticipated week has begun! Our guests have been coming in from across our network, some have come from Germany while others from Spain and Netherlands. This week marks the first meeting for most of the Early Stage Researchers, their Supervisors and our Partners. Having almost everyone from across the DyViTo project in one room really made it clear just what a great team of passionate and driven individuals we have working with us. It was also the perfect opportunity to put some faces to the email address! Lecturer in Optometry, spoke passionately about Open Access. Dr Andrew Logan giving a talk about Open Access at the University of Bradford. Even though Day 1 did set a tone for the rest of the week, which will include training, seminars and talks, we did not forget that this is also an opportunity to introduce everyone to the city of Bradford. Ans this can only mean one thing. Curry! Bradford is considered by many to be the ‘Curry Capital of Britain‘, a title they have won six times between 2011 and 2016. You cannot come to Bradford and not try a curry. Are you in the mood for a Pakistani or a Kashmiri take? Will it be a tikka masala or a rogan josh? This is one of those moments that may put you in a tailspin. Thankfully, Omar Khans came to the rescue. They were able to organise a banquet menu that introduced us to some of the most famous, an delicious, Asian dishes. Team building and networking is definitely better over expertly prepared curry. And when the table goes quiet, you know that the food is good. 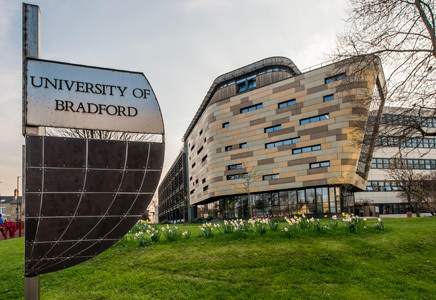 Situated on top of the hill looking over Bradford, the University prides itself on being a world-leading technology institution. With a rich history of cutting-edge research across various disciplines, the DyViTo Project finds its home within the Bradford School of Optometry & Vision Science. The Bradford School of Optometry & Vision Science research group comprises a cohesive, multi-disciplinary approach to investigating vision and visual perception to address important research questions. The group continues to build on over 35 years of vision research at the University. Research embraces a broad range of disciplines including; ophthalmology, optics, ocular imaging, machine vision, psychophysics, biomechanics and visual neuroscience. There is a big emphasis on research across all faculties at the University of Bradford, as the below infographic shows. The DyViTo Project at the University of Bradford is comprised of Professor Marina Bloj, Professor of Visual Perception, Dr Andrew Logan , Lecturer in Optometry, Ellen De Korte, Early Stage Researcher and Olga Ovsepyan, Project Manager.